Yep, Fukushima. After the earthquake and during the ongoing nuclear crisis. 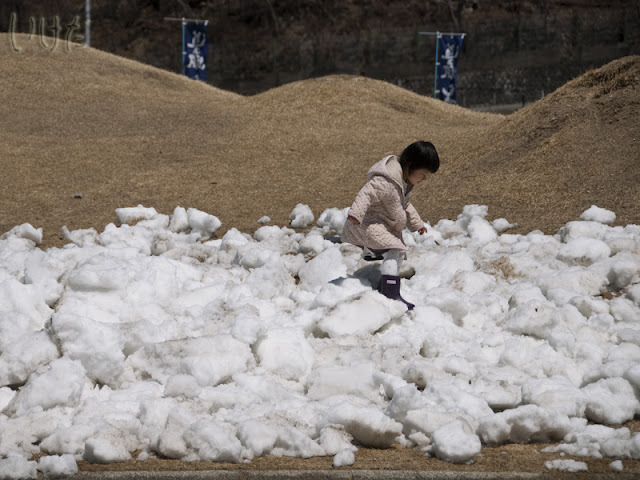 While people left, right and sideways are talking about supporting Fukushima, and Fukushima this and Fukushima that, very few actually do what they preach. Apart from the volunteers and those engaged with all sorts of NPOs (some of questionable usefulness, at least in my opinion), the general thinking seems to be that it's best to stay away. Consuming produce from Tohoku? God forbid, lest we suddenly sprout a third arm and a couple of extra eyes. Actually going to Fukushima? Are you like, insane, or something? 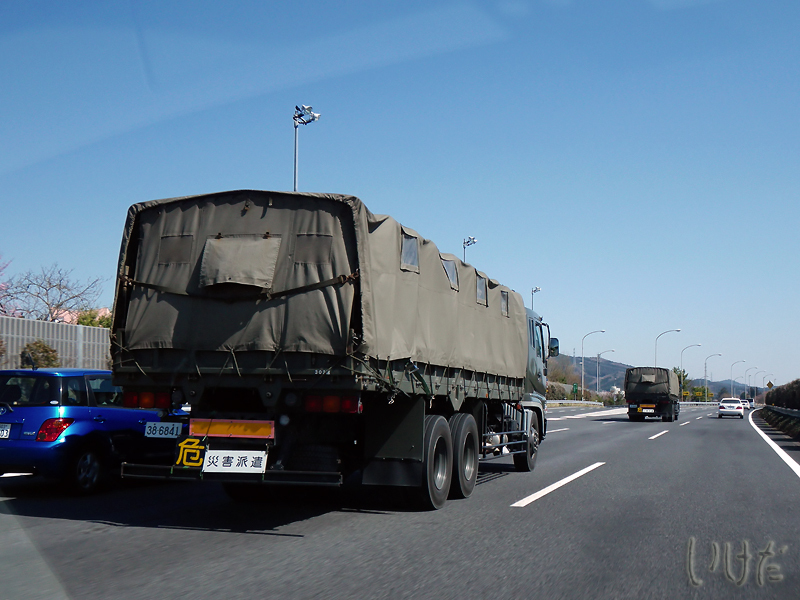 On the Tohoku expressway we saw convoys of SDF disaster dispatch trucks. We also saw trucks hauling earth-moving equipment, some from as far away as Kobe. We took the expressway to Nasu and then switched to local roads. Yeah, something. 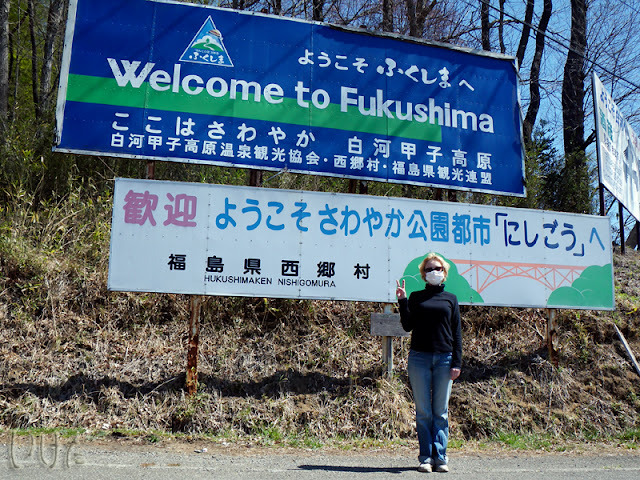 Because we live relatively close to the Fukushima border, we thought it would be a grand idea to see for ourselves all those third arms up there. Sadly, we haven't noticed any. Maybe people camouflage them under extra clothing. Or maybe the Tohokans glow in the dark, instead. Unfortunately, even though we went to Aizu Wakamatsu twice, we haven't stayed the night, so I can't tell you whether they glow or not. Easy! I'm wearing a mask because of my dreadful asthma and pollen allergies, not because of radiation. Either way, we went there to show that as long as you stay away from the exclusion zone around the crippled nuclear plant, it's safe to visit Fukushima. That tourists are loved and desperately needed up there right now. And that anything that can be done to support the local economy is welcomed. 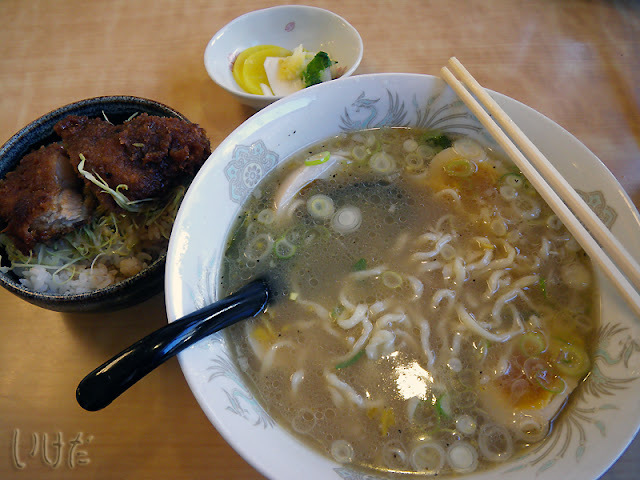 We ended up supporting the economy at a local Aizu ramen shop (right behind the Lion d'Or supermarket on route 118). The place, called "Tonchinkan", was of questionable cleanliness and decor, but their ramen - delicious. 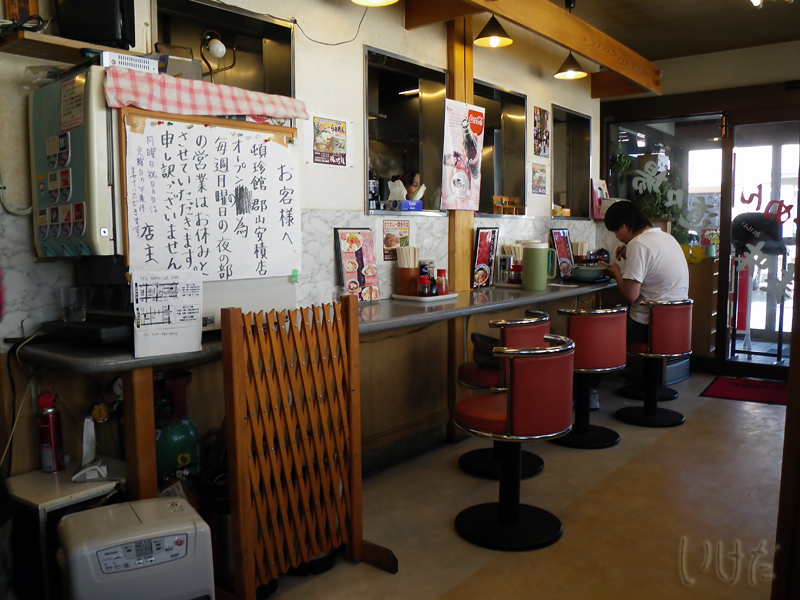 In fact, it was so good, we decided to return there during our second trip to Aizu Wakamatsu. 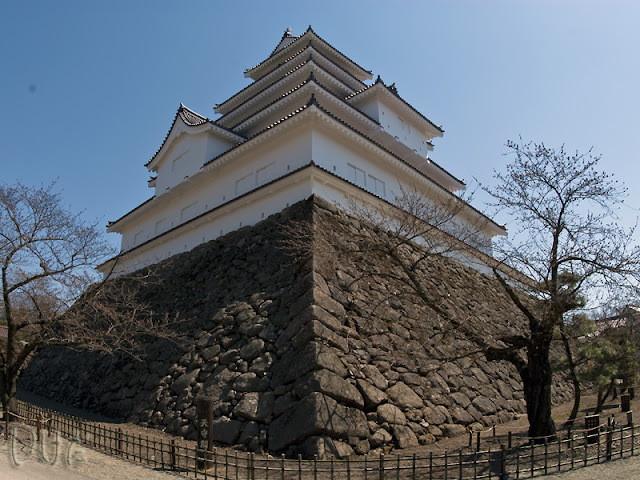 The idea was to drive up to Aizu Wakamatsu and see the famed Tsuruga castle over there. I, of course, was hoping for sakura. Our first trip in mid April was so lovely, even though the cherries were not ready to bloom just yet, that we decided to return two weeks later to see the castle in all its cherry blossom glory. Even though the weather was gorgeous during our first trip, it was still pretty chilly up in the mountains. When we stopped at Ematto, there was still snow on the ground. 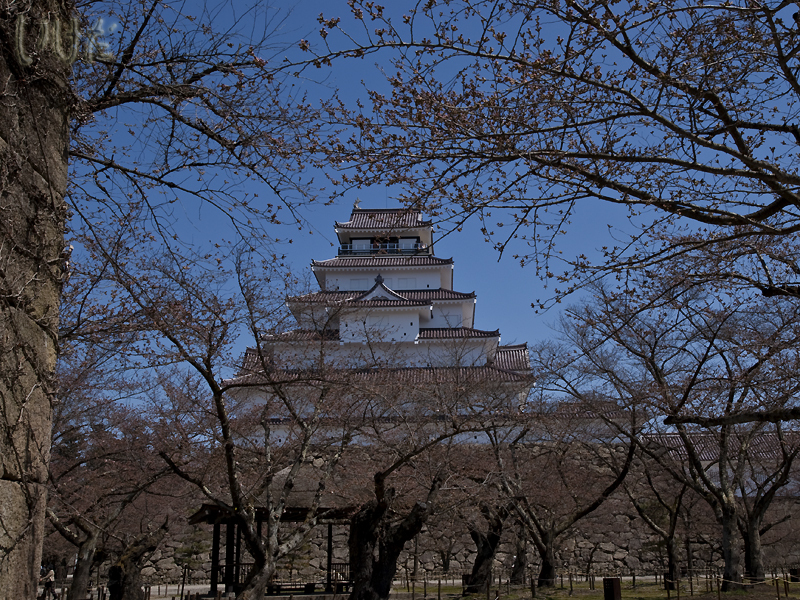 No wonder then, that when we finally reached Aizu, there were plenty of cherry trees, but no cherry blossoms. Taken on April 17th, 2011 - still no sakura. We consoled ourselves by going inside the castle (ticket 500 yen per person, you get a free gift with your ticket purchase). The "I love you Fukushima" song played in a constant loop by the ticket office. There were a lot of visitors at the castle, .and even though I seemed to be the only westerner there, nobody paid me any attention. 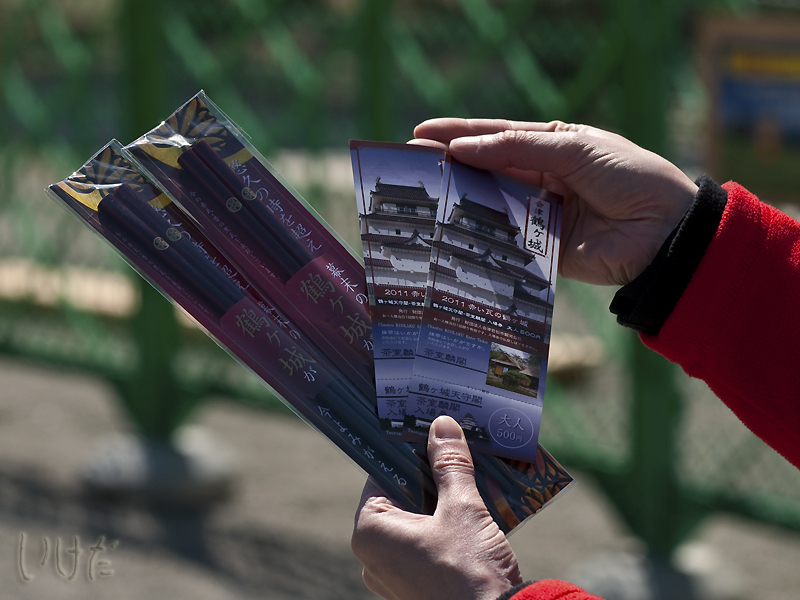 You get a set of chopsticks with the Tokugawa emblem when you buy a ticket to enter the castle. Once inside the castle, we consoled ourselves some more by purchasing stupid amounts of souvenirs. Ok, I consoled myself. The castle itself - it's magnificent. There was no doubt we'd be coming back when the cherries are in full bloom. On the way back home Mister was amusing me with an endless stream of historical trivia about the Boshin War. And we stopped by at Shirakawa to see the castle there - what a shocker that was! This is my own entry to the Show Me Japan series.